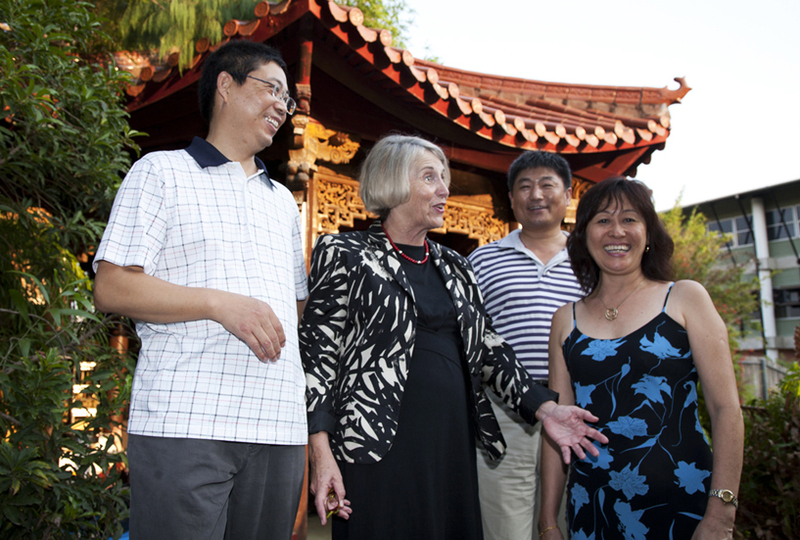 Members of the Chinese community join the Acting Vice-Chancellor, Professor Sharon Bell (second from left), to celebrate the anniversary of the birth of the philosopher Confucius. From left: Longwen (Sean) Xiao, Dr Jacques Hou, and Paula Chung joined the celebrations in the Chinese Gardens on Casuarina campus. The event also encouraged networking with the local Chinese community as CDU prepares to launch its Confucius Institute in 2012. Birthday celebrations for the influential Chinese scholar and philosopher Confucius have been held at Charles Darwin University as it prepares to become a hub of Chinese language and culture education in the NT. In April Northern Territory Chief Minister Paul Henderson joined CDU Vice-Chancellor Professor Barney Glover to celebrate an agreement that will see the establishment of a Confucius Institute at CDU’s Casuarina campus starting next year. CDU Deputy Vice-Chancellor and Confucius Institute Director Professor Sharon Bell said the institute was a partnership between CDU and the Anhui Normal and Hainan universities in China, and would focus on teaching Chinese culture and language. “The Confucius birthday celebration was a great opportunity to celebrate and strengthen ties with the local Chinese community,” Professor Bell said. Professor Bell said refurbishments were currently underway at CDU’s Casuarina campus where the institute would be housed, and would include a state-of-the-art language laboratory and audiovisual technology to assist those learning in remote locations of the NT. During the celebrations at CDU’s Chinese Garden on Friday 23 September, the namesake for the institute was honoured by students for his contribution to Chinese culture, along with a performance by the Chung Wah Society lion dancers and wisdom cake for guests. According to tradition, Confucius is believed to have been born in the Chinese lunar calendar, on the 27th day of the eighth lunar month (between the end of September and the beginning of November) 551 BC.